Author(s): Diego Caccavo, Sara Cascone, Gaetano Lamberti, Department of Industrial Engineering, University of Salerno, 84084 Fisciano (SA),, Italy	Anna Angela Barba, Anette Larsson. Keywords: Controlled drug delivery, hydrogels, mathematical modeling, siRNAs. 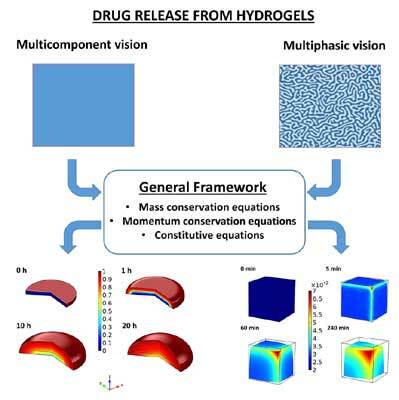 Keywords:Controlled drug delivery, hydrogels, mathematical modeling, siRNAs. Abstract:The controlled delivery of drugs, including siRNAs, can be effectively obtained using Hydrogel- Based Drugs Delivery Systems (HB-DDSs). Successful design of HB-DDSs requires the knowledge of the mechanisms that influence drug release. The modeling of the physical phenomena involved could help in the development and optimization of HB-DDS, sensibly reducing the time and costs required by a trial-and-error procedures. The modeling is rather complex because of the presence of several, synergistic and competing, transport phenomena. In this work a general framework useful for modeling the HB-DDS has been derived and it is proposed, coupling and homogenizing the literature models. It is shown that all of them can be traced back to two different approaches: multiphasic models and multicomponent mixture models. In the first one the hydrogel is seen as constituted by different phases, the behavior of each one being described by their own mass and momentum conservation equations. In the second approach, the hydrogel is considered as made of one phase composed by several components.